With this product you can accumulate up to 50 Glitter Points. 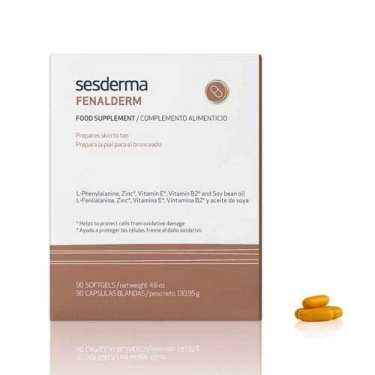 DESCRIPTION: Fenalderm Food Supplement from Sesderma is a dietary supplement that regulates skin pigmentation and prepares the skin for solar exposure. L-phenylalanine and soybean derivatives, treats hypopigmented skin, promotes tanning without burns and protects from the solar radiation. Take 2 capsules, 3 times a day with meals. If necessary, adjust the dosage: 1 pill per 10kg.